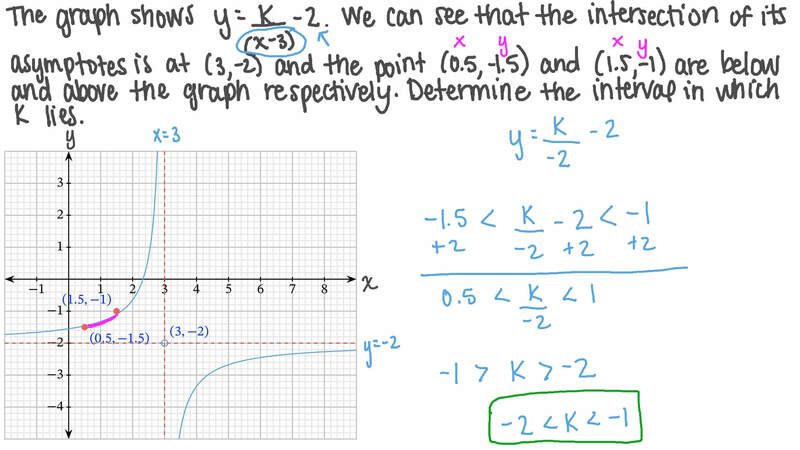 In this lesson, we will learn how to graph reciprocal functions and their vertical and translate the graphs of vertical and horizontal asymptotes. The graph shows 𝑦 = 𝑘 ( 𝑥 − 3 ) − 2 . We can see that the intersection of its asymptotes is at ( 3 , − 2 ) and that the points ( 0 . 5 , − 1 . 5 ) and ( 1 . 5 , − 1 ) are below and above the graph respectively. Determine the interval in which 𝑘 lies.